This one's special. It does things separating it from any other episode, in many regards different from anything in the franchise. There's no trip to the Digital World. In fact, there's no action of any sort. The only evolution sequences are short as the three In-Trainings evolve to Rookie for no reason in particular. Best of all, it brings all eleven digidestined together for the first time in an episode that manages to be reflective and poignant without being a clip show. 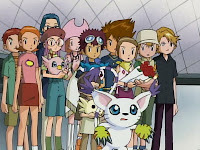 According to TK's calendar, it's Odaiba Memorial, the fourth anniversary of the events of season one. He says August 1st is the day Myotismon was defeated when it's actually the day they all got sucked into the Digital World, but the festivities seem to stretch all the way through the 3rd. That would cover the Myotismon battle. Why else would they call it Odaiba Memorial? It would seem that TK and Kari were originally planning on keeping it among the original eight, only inviting Davis, Yolei and Cody as an afterthought. It's a good thing they did bring them to the reunion, because there's nothing better than seeing the new kids face the pressure of not only the task at hand, but the fear of not being able to meet the expectations set by the original team. This looms large in the minds of all three of them as they hear the story of four years ago, apparently for the first time. On day two, the group splits up into three more manageable units in an effort to not let anyone fall by the wayside. Sora and Mimi take Yolei to Tokyo Tower to recall its umpteenth destruction. While lounging around with Tai, Cody, Davis and Kari, Izzy explains his unimpressive theory that the digital gate is controlled by the D3 and not one random computer at school. It's not a stretch and was sort of implied anyway, but it's a necessary move to allow for additional access points like the campfire sequence over the next few episodes. The real kicker is Matt and TK. 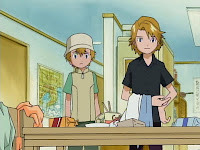 Along with a trip to Shibuya and a chance to recall Pumpkinmon and Gotsumon, little brother gets to experience the lifestyle of the Ishida men, which involves a messy apartment, a sink full of dirty dishes and nothing in the fridge. 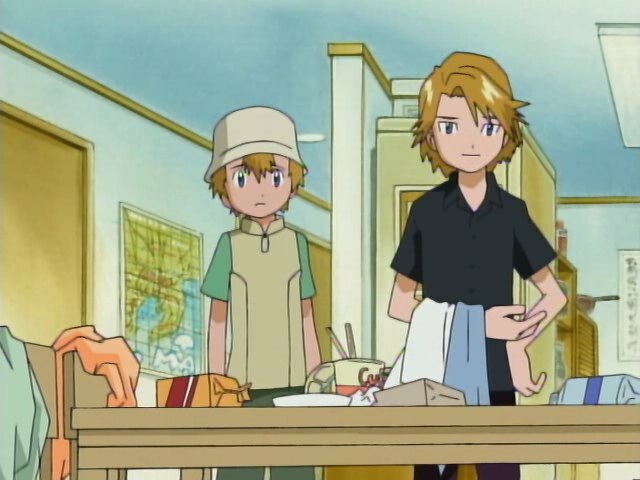 Matt cooking and serving TK an outrageously spicy dish introduces us to his more playful side, one of the many character traits that has developed between season one and season two (other major ones include Sora shedding her tomboy side and Mimi being happy and awesome around everything). It also marks the triumphant return of Hiroaki Ishida! Sound the fanfare! Actually, Hiroaki's totally wiped because there have been strange sightings and equipment malfunctions at the TV station that are being blamed on a ghost. His inability to punch the problem in the throat or crash a car into it is leaving him stressed and relying on silly self-help tapes. The haunting only gets worse the next day, but luckily the TV station is the final stop on the Odaiba Memorial tour. Gatomon senses the presence immediately and rushes in. While the other Digimon assume something evil, Gatomon realizes that it's just Wizardmon and he just wants to pass on a message. 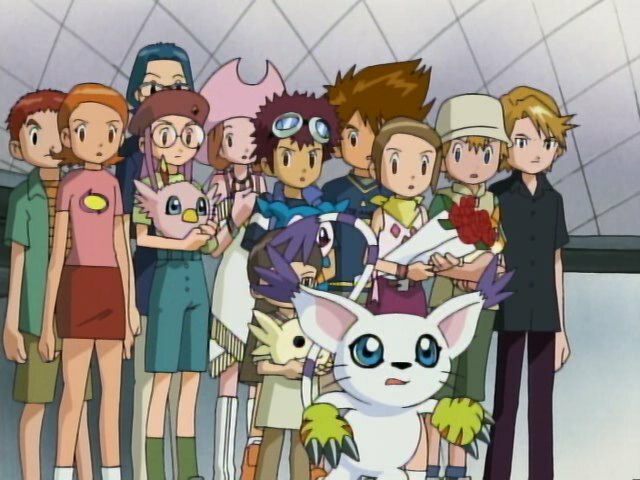 While he's just giving out a vague prophecy on how the new kids will need to win, it's the expression on Gatomon's face that intensifies the scene and seals the moment. 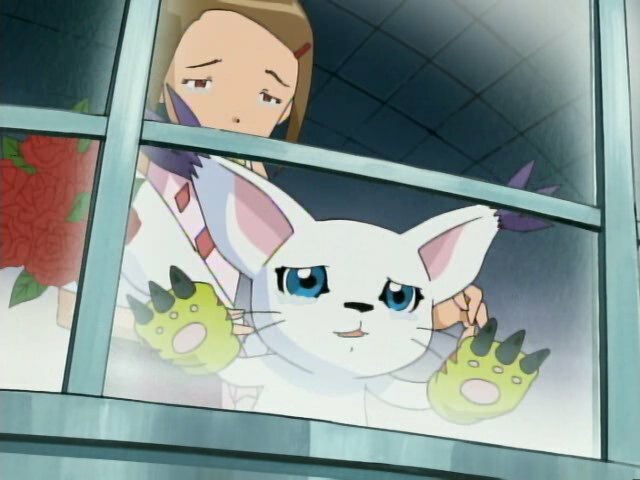 Especially when Wizardmon leaves and Gatomon races to the window, lost again for a moment until Kari comes in and cradles her. It's the kind of quiet moment that feels like it lasts a lot longer than it does, and yet doesn't feel long enough. Oh, and remember how I hated how they did the prophecy about VenomMyotismon in season one? This one's far better- ambiguous and set to slowly piece itself together throughout future episodes. This is the kind of prophecy that makes me a happy little buffalo. Second straight whiff on the episode title, made even worse now that Yu-Gi-Oh Abridged rendered the line “ghost of a chance” completely unusable. It's a bad pun then just as it is now. Davis uses it in the episode itself and Kari sarcastically replies “nice one.” At least that better have been sarcasm. To compound things further, the Japanese title is simply “Odaiba Memorial,” which is a classy title for anything. Everybody notices the look of horror on Davis's face when he originally fears that this August 1st thing involves TK and Kari going on a date. What is even better is the smirk on Yolei's face as she enjoys his reaction way too much. On that note, Kari's really pleasant and cheerful about shooting down the notion that it's a date. She has this happily dismissive “of course not, silly.” Gotta wonder what TK's thinking during that exchange. Welcome to her friend zone, TS. Population: You. Why isn't Kari into TK? Maybe because he forgot that she wasn't part of the original group! How the hell do you forget that?! Then again, this is the group that conveniently forgot about the Highton View Terrace incident. Personally I've always found the Japanese title more moving instead of being overly grand and announcing major events, it is simplistic and touching. And as far as I know this is the only one of that category in the entire series. It's cool seeing Wizardmon again, especially as it actually does a half decent job of foreshadowing Myotismon at the end of the season (which is sorely needed), but you got to question how Wizardmon came up with this prophecy. Is he able to gain information as a ghost due to the digital status of the TV Station? Is it just a general power of a Wizard like Digimon? Has he been going over to Myotismon's ghost house to watch ghost movies as they passively aggressively bond over being ghosts? Or is it just hackney writing?